Disclaimer: BackBlaze gave me a year of free backups for this review. However, all opinions below are my own. Backing up is probably the most important step anybody can take with their computers. It’s also likely the least performed step anybody does. Over the years, my backup routine has changed. I used to backup everything to CDs, then to DVDs when I had too much data for a group of CDs. Eventually, I had too much for DVDs and I moved to external hard drives. I copied my important files to an external hard drive and copied that to a backup drive (in case the first one failed). There were just two problems with my backup routine. First of all, it wasn’t automatic. I had to remember to connect the drives and run the backups for each of our computers. Frequently, I’d forget for months on end leaving important data vulnerable. Secondly, while I would theoretically take the second drive to an off-site location (i.e. somewhere other than my house), practically I’d never get around to it. This meant that one burglar or house fire could mean the loss off everything. I’ll admit, for the longest time I scoffed at cloud backup services. Why would you pay so much for a tiny amount of backup space? For the amount I would need to pay to backup all of my important data (photos, videos, documents, etc. ), I could get a new hard drive every year. Recently, though, I started to realize how vulnerable my backups were. External hard drives were good for a local backup but without the off-site component, we could lose everything in a matter of minutes. I researched online backup services and many of them suffered from the same flaw: I had over 1TB to back up and they were all offering plans starting much smaller and quickly riding in price. It looked like my scoffing days might continue and my data might continue to not be as safe as to could be. For only $5 a month, BackBlaze gives you unlimited space to back up your files. Unlimited means that you don’t have to worry about extra files pushing you over a limit and costing you extra. If you have 3TB of files to backup, it will cost you the same as if you have 100GB. When you sign up for BackBlaze, you download the BackBlaze Control Center. This application will let you decide which files are backed up and which are skipped. It can also manage how fast the backup runs, since you might not want to flood your Internet connection with backups and have nothing left to stream Netflix. You can also get an estimate on how long your backup will take. At this point is where I hit my first roadblock. You see, where I live my available high speed Internet isn’t that fast. Right now, we get 15Mbps down and 1Mbps up. I had about 880GB to download. Even if I flooded my entire 1Mbps with the backups and ran them 24/7, it would take 82 days to complete my initial backup. At a more reasonable half-of-my-available bandwidth, it would take me 163 days. If you have a faster Internet connection or less to download, you will complete your backup much quicker. After that, subsequent backups will run quickly since BackBlaze won’t need to upload ALL of the files that you want to backup – just the new and changed ones. So what happens if your files are lost? After all, a backup service without a decent recovery option isn’t worth anything. To this end, BackBlaze gives multiple options. First of all, BackBlaze’s software can download your data just like it uploaded it. Of course, while this option might not cost extra, it could involve extra time depending on your Internet speeds and how much data you are backing up. In my case, if I used my entire bandwidth every hour of every day, I could get everything back in five and a half days. At half of my bandwidth, it would take about eleven days. The second option involves BackBlaze sending you a flash drive containing up to 128GB of data. This costs $99. BackBlaze can also send you a 4TB USB hard drive with your data for $189. The drives are yours to keep or you can return them within 30 days and get refunded the entire cost. Yes, this does mean that the flash drive and USB hard drive options would wind up being free after the refund goes through. So would I recommend BackBlaze? I have two main reservations about the service – one that is in BackBlaze’s control and one that is completely out of their control. Their software operates on a "backup everything except for exceptions that you list" basis. This means that, by default, it is trying to back up way too many files. Sure, they exclude your Windows system folder by default, but still your hard drive is filled with files that you don’t really care about. It would be better if their software allowed you to choose whether you want to backup everything except for exceptions or only back up folders of your choosing. The factor that BackBlaze can’t change is ISP upload speeds. As mentioned earlier, this can turn any online backup service from useful to "too slow to do any good." After backup up constantly for a few weeks, BackBlaze is still estimating another 120 or so days until my initial backup is done. I understand that there’s nothing that BackBlaze can do to fix this on the ISP end, but it would be nice if that USB hard drive option worked the other way as well. BackBlaze could send a hard drive (with a refundable $189 deposit to make sure people didn’t just keep the drives), have you copy your files to the drive, and then mail it back. Once the drive arrived back at BackBlaze, they could upload the data much quicker and issue a refund for the drive. This could turn six month long initial backup sessions into one week long initial backups. Still, even with these limitations, I would still recommend BackBlaze. The service seems very fast and stable and the price is definitely right. For the same price as a year of unlimited space at BackBlaze ($60), I would need to pay $120 for 1TB on Google Drive or Dropbox or $84 for 1TB on Microsoft OneDrive. All three of these require me to pay more for less space. No matter what you do – be it cloud backup, saving to external hard drives, or burning to disc – backups are a vital part of keeping your digital data safe. Make sure that you come up with a plan that protects your files from as many different threats as possible. 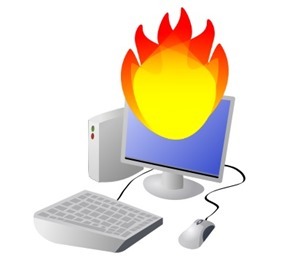 NOTE: The image above is a combination of "Cartoon Computer and Desktop" by DTRave and "Fire" by matheod. Both are available from OpenClipArt.org.